Funko has revealed the release dates for three upcoming My Little Pony Pop! 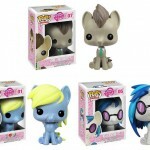 Vinyl Figures and two new My Little Pony Vinyl Collectible Figures. We’ve seen two of the individual MLP Pop! Vinyls before as well as all three in a Variant Amazon Exclusive MLP Pop! Vinyl 3-Pack. These were previously Hot Topic exclusives. They are now being distributed to other stores. 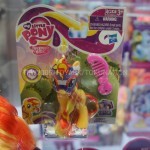 From Hasbro’s SDCC 2013 display comes photos of their My Little Pony items. Also, the Funko POP! 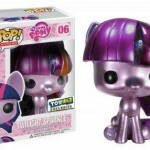 Vinyl Fan Page revealed Metallic My Little Pony Exclusives. We’ve received word from ToyWiz that the Twilight Sparkle and Pinkie Pie are ToyWiz exclusives. The Rainbow Dash is a shared exclusive with Gemini Collectibles.You can see the Ponies at Toywiz by Clicking Here. You can check out all of the images after the jump. Two more figures have been revealed. they are Derpy, though not named Depry on the package and DJ Pon-3. Read on to check out the figures.